AmiQure Omega3 supports the kidneys, has beneficial effects on the heart and blood vessels, promotes supple joints, and soothes sensitive or irritated skin. Many scientific studies have shown that humans and animals greatly benefit from omega-3 fatty acids. The active ingredients in omega-3 are EPA and DHA, 190 mg and 35 mg respectively. The purity of these oils determines their quality. The fish oil used for amiQure Omega3 comes from responsibly caught open sea fish (including anchovies, sardines and mackerel). Since the essential fatty acids are very sensitive to oxidation (rancidity), the supplement is most widely used in capsule form. Due to possible oxidation, it would be difficult to process into food. 2-3 capsules per 30 kg of body weight, daily. At the start of a course, use 1 capsule per 10 kg body weight for 4 weeks. 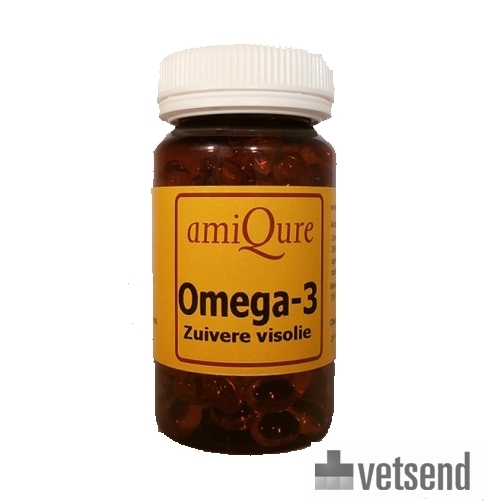 Have you used amiQure Omega3 before? Let us know what you think about this product.